QUEZON CITY – Minimum wage earners and informal sector workers fell further in deeper poverty three months into the increases in the prices of goods and services due to the implementation of the Tax Reform Acceleration and Inclusion (TRAIN) excise tax on fuel and sweetened beverages and the increase in prices of government documents. In a monitoring of prevailing prices by the Bangko Sentral ng Pilipinas (BSP) and the National Wages and Productivity Commission (NWPC) released on February 9, 2018 , the real value or the buying power of the country’s 17 regions total average daily nominal minimum wage of P329.35 is now only P210 a day. In Metro Manila, the country’s highest minimum wage, the buying power of P512 daily minimum pay fell to P357.29. On the other hand, the real value or purchasing power of the country’s lowest minimum pay of P265 a day in the Autonomous Region in Muslim Mindanao (ARMM) is P152.12 a day. As of March 1, 2018, the total purchasing power of workers for a month fell to P8,575. However, according to the Philippine Statistics Authority (PSA), the published standard amount needed by a family of five to survive within poverty line in 2015 is P9,064. “We noticed the erosion of wage’s purchasing power move quickly downwards by 6% in just a matter of two months from January to February upon the affectivity of TRAIN. This extraordinary devaluation of monthly salary is significant to the informal sector workers earning less than P12,000 a month and the minimum wage earners receiving less than the same amount,” said Alan Tanjusay, spokesperson of labor group Associated Labor Unions-Trade Union Congress of the Philippines (ALU-TUCP). “We urge government’s immediate and quality response to save and prevent these workers, who help build our economy and who are producers of goods and services to make our economy competitive, from falling through the cracks,” Tanjusay said. With the inflation rate hitting 3.9 % by the end of February 2018, the ALU-TUCP expect it to rise by the end of the month in the light of impending increases in the cost of electricity, rice, fish, sardines, vegetables, condiments and prices of gasoline. The March 15 meeting between ALU-TUCP and President Duterte on the group’s proposed P500 government monthly subsidy was moved to March 22. The ALU-TUCP proposed to Duterte an amelioration program called Labor Empowerment and Assistance Program (LEAP). Under the program, minimum wage earners will received monthly a P500 worth of grocery items to help the workers cope with the rising cost of living caused by TRAIN. QUEZON CITY – Karapatan condemns the listing of more than 600 persons, human rights defenders and critics of the Duterte government in the proscription petition filed by the Department of Justice (DOJ), through Senior Assistant State Prosecutor Peter Ong, at a regional court in Manila on February 21, 2018. The petition not only seeks to declare the Communist Party of the Philippines-New People’s Army (CPP-NPA) as terrorist organizations but also named individuals as their supposed leaders or members, including those who are dead, missing and members of paramilitary units accused of killing Lumads in Mindanao. “There is no doubt that the filing of the petition is an effort to sow fear and panic among Duterte's supposed detractors, subjectively prepare the public for more intense political repression, and be the front act of a crackdown against the dictator wannabe's critics. 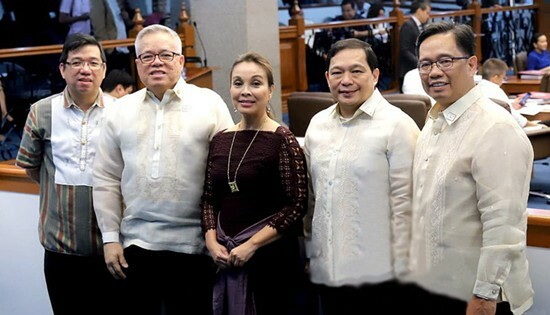 The list of leaders and members is a take-off from the Order of Battle (OB) lists of the Gloria Arroyo and Noynoy Aquino regimes," said Karapatan Secretary General Cristina E. Palabay. She recalled that persons listed in the OB often ended up arrested based on false charges, incarcerated and even tortured, missing or killed. “Not only do such lists incite human rights violations, they also legitimize and make "normal" to the public the government's abuse of power in suppressing dissent and decimating the supposed ‘enemies of the state’,” she stated. The Karapatan leader also said that the list is “severely defective as it contains scores of aliases (aka), John and Jane Does so any person can be added later." "The list also contains seven names of paramilitary group members including four from the New Indigenous Peoples' Army (NIPAR), led by Alde "Butchoy" Salusad, who have standing warrants for the killing of Lumad leader Datu Jimmy Liguyon. They also have been presented and paid as surrenderees, consistent to their being all-purpose pawns in the military's repressive schemes,” Palabay said. “On the whole, DOJ’s proscription petition is dubious and a maneuver meant to harass, target and criminalize persons in progressive organizations. We should oppose this and other tyrannical acts that brand legitimate dissent and activism as ‘terrorism.’ What should be addressed instead is Duterte’s brand of state terrorism, which has victimized thousands. Indeed, shouldn't Duterte be branded instead as the number 1 terrorist?” Palabay concluded. Edgar B. Tabacon, DPWH-8 Regional Director (wearing blue polo) visits Biliran Province on March 2 and conducts inspection of CarayCaray Bridge with Engr. David P. Adongay Jr., (wearing checkered polo) District Engineer of Biliran District Engineering Office (BDEO) and Engr. Alfredo L. Bollido, (wearing red polo shirt) Assistant District Engineer to assess the status of the restored CarayCaray Bridge after being damaged by TS Urduja in December, 2017. NAVAL, Biliran – Engr. Edgar B. Tabacon, Regional Director of the Department of Public Works and Highways (DPWH) Region VIII conducts inspection of CarayCaray Bridge with Engr. David P. Adongay Jr., District Engineer and Engr. 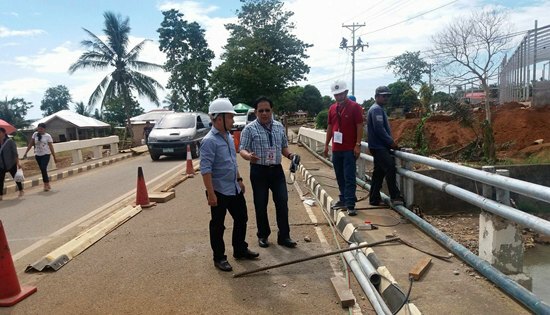 Alfredo L. Bollido, Assistant District Engineer of Biliran District Engineering Office (BDEO) on March 2 to assess the status of the said bridge. After Tropical Storm Urduja, BDEO is exerting efforts to restore the CarayCaray Bridge within the 30-days timeline set by DPWH Secretary Mark Villar. During the inspection of RD Tabacon, the approaches of Caraycaray Bridge is undergoing riprapping works to ensure that the remaining structures can still sustain another flooding while waiting for the construction of the new bridge. Construction for the new CarayCaray Bridge is already under Preliminary and Detailed Engineering (PDE) stage undertaken by the Regional Office thru consultancy. The approaches of the said bridge was severely damaged during the onslaught of TS Urduja last December, 2017. Heavy vehicles are advised to take the alternate long route Naval-Almeria-Kawayan-Culaba-Caibiran-Cabucgayan road and vice versa. 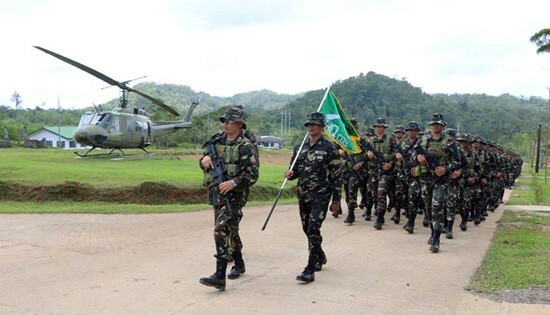 The gallant members of 93rd Infantry (Bantay Kapayapaan) Battalion led by LtCol. Hilarion G. Palma. CAMP LUKBAN, Catbalogan City – The 8th Infantry (Stormtroopers) Division, Philippine Army formally closed the Battalion Organizational Training of 93rd Infantry (Bantay Kapayapaan) Battalion with Maj. Gen. Robert M. Arevalo, Acting Commanding General, Philippine Army as the Guest of Honor and Speaker at the 8ID Battalion Retraining Facilities (BRF), Camp Eugenio Daza, Barangay Fatima, Hinabangan, Samar on March 8, 2018 at 11 o’ clock in the morning. Bantay Kapayapaan is a newly organized battalion and composed of seasoned Officers and Enlisted Personnel who underwent a four-week organizational training. The newly organized unit is part of the 10 Battalions that will be activated to fast tract the AFP’s peace and development efforts all over the country. Maj. Gen. Raul M Farnacio, Commander, 8ID in his remarks, congratulated all the gallant members of Bantay Kapayapan headed by Lt. Col. Hilarion G. Palma for successfully completing the battalion organizational training. He further urged them to live up to the unit’s creed. “As we welcome you to the battlefield, I remind all of you to perform only your duty as a disciplined soldier, establish rapport with the people, build bridges to communities and especially those that long have been under the shadow of the terrorists. We have already won significant amount of the people support especially during our effort in Mindanao and Marawi. It is our time or golden opportunity to produce decisive accomplishments against our enemies and be the best example of our profession to the Filipino people,” Maj. Gen. Farnacio stated. Tired but this agrarian reform beneficiaries are still happy as they savor their first harvest in the sugarland awarded to them 21 years ago. ORMOC CITY – Tired but obviously happy was how the agrarian reform beneficiaries (ARBs) in Barangay Sumanga looked on Tuesday as they savor their first harvest of sugarcane within the 17.5-hectare land awarded to them under the Comprehensive Agrarian Reform Program (CARP) 21 years ago. “Masaya kami dahil may income na kami. May pambayad na sa lupa, at matutupad na ang pangarap ng anak ko na makapagtapos ng pag-aaral.” (We are happy because we now have income. We can now pay land amortization, and my child’s dream to get a college degree will already be realized.) These were the words of Pablo Silva, 55, one of the 24 ARBs and president of the Sumanga United Farmers Association (SUFA) during the interview. 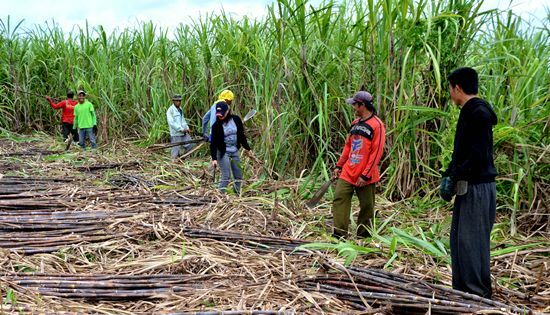 Pablo shared that during Tuesday’s harvest they are expecting about 15 truckloads of freshly harvested sugarcane with an estimated net income of P14,000 for every truckload. Though this is no longer a big deal to Pablo, still he appeals to concerned sectors to help them have an access road. MANILA – Hundreds of women marched to Mendiola on International Women’s Day to decry the present administration’s inaction and contribution to the inequality that continues to be experienced by Filipino women today. Members of women’s movement Oriang denounced President Duterte’s frequent anti-women statements and failed policy promises as major threats to the state of Filipino women’s rights, particularly to their rights to work, livelihood, health, and security. “Duterte stepped into the presidency bearing the promise of real change, but he has delivered nothing but the same dismal conditions to Filipinos – if not worse,” said Flora Asiddao Santos, National President of Oriang. “His failure to end labor contractualization along with his betrayal of the poor through the deadly War on Drugs and the burdensome TRAIN Law have exacerbated the marginalization of the most vulnerable groups in society – primarily, women,” said Santos. “On this International Day of Women, it is important that we surface the very distinct and dire manner by which women experience social inequalities,” said Oriang Secretary General Oyette Zacate. According to Oyette Zacate, apart from the usual impacts of issues like labor contractualization, unemployment, violence, and environmental degradation, women experience additional pressures and burdens due alone to their position as women. “Women are hit harder by this administration’s unequal policies. We see this in the discriminatory retrenching of pregnant women in labor contracting firms, in the greater rate of violence against female OFWs, in greater rates of land grabbing and unpaid agricultural work committed against rural and indigenous women, in the harsher impacts of TRAIN-caused high prices on poor women and women vendors, and in many other issues of social inequality,” said Zacate. Kimberly Arriola, Oriang Vice Chairperson, then condemned Duterte’s proposed federalism as another so-called ‘change’ by the administration that threatens to breed a host of inequality impacts for women. “As long as patriarchal and elite governance is the norm in the country, federalism will only serve to bolster the marginalization of vulnerable groups like women – especially poor women – while fattening the pockets of existing political dynasties and corporations,” said Arriola. Arriola also condemned the Duterte administration’s unapologetic misogyny, as manifested in lascivious and violent remarks thrown frequently by various officials, led by the President himself. “The Philippine society’s perception of the rights and dignity of women as human beings is at a danger of being in decline due to a trend of misogyny within our government,” added Arriola. “Although done under the guise of humor, this behavior of our leaders is no laughing matter for women at actual risk of greater discrimination and harassment,” she said. According to Flora Santos, the administration’s gross neglect and trampling of women’s rights and women’s issues serve as a wake-up call for women all over the country to collectively push back. “Duterte and the rest of his administration have revealed themselves as false agents of change in this country, especially in the lives of women who have had to suffer through age-old sexism through countless administrations,” said Santos. “We thus call on Filipinas to rise up and actively resist an administration that has unapologetically shown contempt for women and other vulnerable sectors,” she said. “The International Day of Women has taught us that it is not through select leaders, but through the organization and collective action that true equality is achieved and preserved,” she concluded. 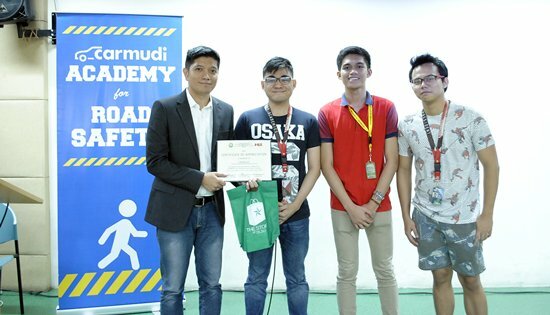 TAGUIG – After officially launching its Corporate Social Responsibility (CSR) initiative, global online car platform Carmudi has renewed efforts, starting off its road safety campaign for this year in one of premier universities in the country. The Carmudi Academy for Road Safety (CARS) program kicked off for 2018 at the De La Salle University (DLSU) in Manila. The CARS program is designed to create awareness and help students – particularly in Universities and Colleges – raise their basic understanding of road safety. During the event, Kris Lim, Head of Public Relations and Marketing of Carmudi Philippines, reiterated the road safety program focuses on three fundamentals that would lead to better and safer driving: right knowledge; right skills; and right attitude. He shared to the participants some facts and figures pertaining to road safety, specifically road accidents that occurred in the Philippines. According to Lim, a surprisingly huge number of the motoring public (composed of drivers, pedestrians and commuters) lack the basic knowledge of road signs, markings, traffic rules and regulations, does not have the sufficient defensive driving skills and as does not practice proper attitude while on the road. He also said that the program held at De La Salle University (DLSU) is just the start of series of campus workshops that they will be doing as the year progresses. “Instilling in their minds the key factors to better and safer driving is not a one-time event but a continuous program for Carmudi," Lim said. "Our aim is to create a harmonious and safer driving environment for motoring public," he added. Further, the Automobile Association Philippines (AAP) – a constant partner of Carmudi Philippines in its road safety efforts – took part in the inauguration of the CARS program. Through AAP Advocacies Manager Cynthia Reyes, the national auto club discussed the overview of Republic Act 4136 – also known as the Land Transportation and Traffic Code – and showed scenarios which resulted in road crashes. Aside from AAP, Carmudi also invited road safety advocate Arnel Doria that further discussed the advantage of defensive driving on the road and driving behavior of motorists. Meanwhile, Lim said that they will moving around the country, as they are now in talks with various colleges and universities that shares the vision of creating a sustainable road safety effort in the motoring facet of the country.